This week is British Science Week and, with the UK General Election just weeks away, UK grassroots campaign group Science is Vital is encouraging people to e-mail their MPs and parliamentary candidates to highlight the need for increased investment in science. We’ve just released shocking statistics which show that the UK’s investment in research as a fraction of GDP is lower than any G8 country in the last 20 years. You can find out more in our Guardian blog entry, and information on contacting your MP and candidates at the Science is Vital website. I’ve e-mailed my MP, Lib Dem Lynne Featherstone, asking for her support for increased funding. I’ve also contacted my local Labour candidate Catherine West, and Green contender Gordon Peters. I can’t currently find any way to contact the Conservative candidate…I’ve had to send the local Conservative Association a Facebook message! Watch this space. My message to Lynne is copied below. Other messages were tailored slightly for other recipients. If you’re thinking of writing to your MP, I hope it can provide a bit of inspiration. Feel free to use it as a framework, but be sure to add some of your own personal thoughts for maximum impact. I am writing to you as one of your constituents to express my concern at the current levels of investment in research by the UK government. As well as being a practising scientist working for Cancer Research UK, I am the Vice-Chair of a grassroots campaigning organisation called Science is Vital. This week, we have released new figures showing that the UK invested less than 0.5% of GDP in research in 2012, placing us not only lower than any other G8 country, but lower than any other G8 country in the last 20 years. This is a cause for significant concern for a number of reasons. UK science is widely recognised as world-leading, but we will not be able to maintain our internationally recognised excellence if investment continues to decline. Secondly, public funding of science offers huge potential for economic return. For example, a study published last year found that return on government and charitable investment in cancer research since 1970 was a substantial 10% per year. But the GDP figures and economic issues they highlight are merely indicative of my deeper concern: science is woefully underfunded compared to the scale of the problems it is trying to solve. For example, cancer kills about a third of people, and yet we spend less than £5 per person per year on public-funded cancer research. I would argue that this is grossly disproportionate—if a disease has a 30% chance of killing me, I want to spend more than a handful of pounds per year to understand its causes and look for treatments. And cancer is arguably the best-funded condition: stroke is responsible for 10% of deaths, and the government spends less than 30p per person per year on stroke research. These kinds of shocking figures recur across science, from applied research in areas like health and energy, to blue-skies research such as space science and particle physics. I have attached a factsheet outlining some of the key statistics, and you can find more at scienceogram.org. Research funding is a subject of huge relevance to everyone, on a local and national level. Many of your constituents, including myself, are employed in scientific or technical jobs in London’s universities, research institutes and private companies. Social sciences and humanities also have huge importance, both as academic disciplines and with their potential to feed into evidence-based policy at all levels of government. There are also significant wider social benefits from research, from new drugs and treatments to cleaner and cheaper ways to generate energy. I’m sure you’re also aware of the huge potential which both science and the humanities have to impact upon your portfolio in international development, from understanding the impacts of climate change to developing treatments for neglected tropical diseases. While not often debated in politics, research funding is of huge significance to many voters, and I believe it should be an election issue. 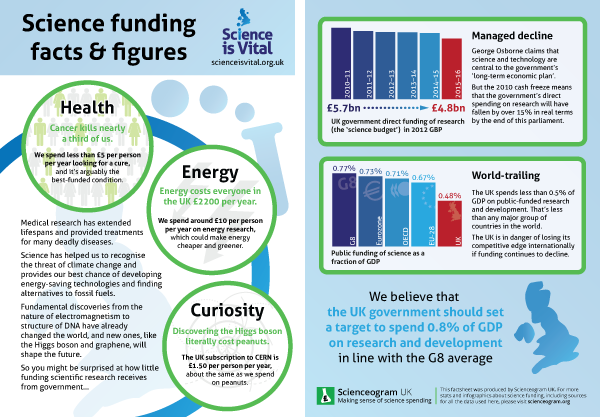 Science is Vital is calling on the UK government to set a target to invest 0.8% of GDP on research and development, in line with the G8 average. I would call on the government to go further and, adopting the kinds of comparisons which I outlined, seek to invest in science at a level commensurate with the size of the problems science is trying to solve. I hope that, in British Science Week and with the General Election only weeks away, it will be possible for you and your party to support these goals. I would be very keen to discuss the issues raised in this letter further, and look forward to your response.